"Uganda Baati is the country's leading manufacturer and supplier of roofing sheets and has the widest range of roofing products in galvanized, aluminium-zinc coated and pre-painted material. 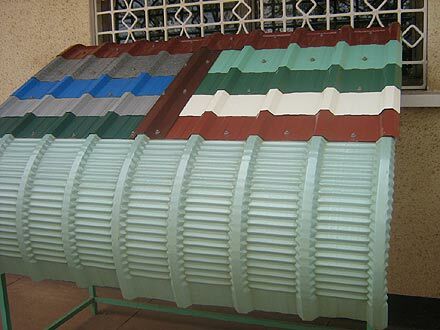 We are the only company in Uganda that make galvanized coils, which are used to make iron sheets," says Rakesh Bhatnager, the company's Executive Director. In recent years, Uganda Baati started making Resincot (superior coloured sheets), Covermax and Versatile (which look like real ceramic tiles) brands. The company also produces all nature of building accessories including gutters, valleys and ridges. Uganda Baati is part of the SAFAL Group, a group of companies manufacturing flat and long steel products in Eastern and Central Africa. SAFAL, which is based in Mauritius, was established to consolidate the operations of several allied companies in Kenya, Uganda, Tanzania, Ethiopia, South Africa, Zambia, Angola and Malawi. On a visit to the huge Uganda Baati factory, the multitude of vehicles and porters moving about carrying different iron products indicates a very busy factory and plenty of business. 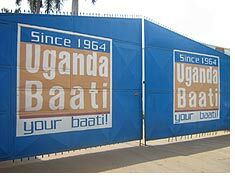 Uganda Baati factory is located on roughly 5 acres of land at Kibira Road in the industrial area of Kampala near Bugolobi. The factory is divided into: The hollow-ware section (where making of iron bars, angles, pipes etc takes place) and the sheet section where corrugated sheets, Versatile sheets and Covermax sheets are made. A steel sheet being rolled at the Uganda Baati factory in Kampala. After visiting at the production lines of this factory, you get to realise why Uganda Baati won a 'Quality Management Systems' award from the International Certification Network. The company has been recognized for manufacturing top class galvanized corrugated roofing sheets. In 2004, Uganda Baati won the 'Quality Award' from Uganda Bureau of Standards for producing quality products. "It is the oldest steel making company in Uganda. It has been a very stable company for all these years," says Bernard Rubunda, Uganda Baati's Personnel Manager. Rubunda, who took Ultimate Media around the plant, says the factory alone is a US$15 million investment. Bhatnager adds that their galvanising line was built and equipped with the finest equipment available in order to satisfy all market requirements. "The plant is operated by qualified and well-trained, in-house technicians with many years of experience in the manufacture of galvanised products, known country wide as the Lion brand. In accordance with the company's policy of providing international quality products and better choice to consumers, it supplies its aluminium-zinc products under the Zincal brand while its renowned Resincot brand includes both pre-painted sheets and accessories." Uganda Baati has also started making Covermax sheets, a technologically superior product that is preferred by both the affluent and low income earning populations because of its beauty and low cost. The Company is registered with the Uganda National Bureau of Standards and has ISO 9001:2000 Certification. Bhatnagar says Uganda Baati has always ensured quality and innovation in its products through its commitment to follow the kaizen principles resulting in superior products for its ever widening client base. These principles include modern production techniques and innovative solutions to achieve world class manufacturing. The growth and success of Uganda Baati has intrigued many, given the fact that it imports all its raw materials. "We import iron coils and zinc, our major raw materials, from Kenya," says Jaideep Mohan, Uganda Baati's Chief Marketing manager. 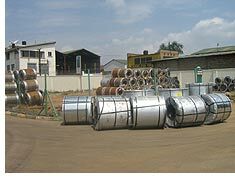 A selection of Uganda Baati's steel products. He says Uganda Baati has strongly established itself as a leader in the market and boasts of over 200 regular customers in addition to countless walk-in customers. "Our products cater for everyone. Whether you want one iron sheet, 100 iron sheets, or a special design, we supply it to you." He says that despite the troubled economic and political regimes in Uganda, Uganda Baati has survived because it supplies "quality products at the best price", pay taxes to government promptly and honestly and gives sound employment to many Ugandans. Uganda Baati currently employs about 270 Ugandans. "We provide tailored sheets and mould them to your specification. We also give after sales services like helping design your roof to make it cost you the least money as well as erecting the sheets, which has endeared us to many customers," Bhatnagar says. He intimates that they have survived in the market because of their sincerity, first class customer service, dedication, honesty as well as the quality of their products. "Uganda is a good market. There is ample scope for progress as you can serve Uganda's neighbours." Uganda Baati sells its products not only in Uganda, but in neighbouring Rwanda, parts of Democratic Republic of Congo, Southern Sudan and Burundi. "Today, Uganda Baati specialises in providing customised roofing solutions. We have continually improved our product line-up to include specialized products like burglar proof roofing tiles and iron sheets with insulation against heat. We have products for the low income earners as well as products for the high-income bracket," Bhatnagar says. Mohan also believes they have managed to excel in Uganda not only because they maintained the supply of quality and dependable products, but because they don't invest in businesses which local businesses in Uganda can manage. "We don't invest in the transport industry for example, neither in retail shops because this can create antagonism and feelings of unfair competition amongst local Ugandans," he says. Under the Ugandan government's policy of promoting investment and encouraging industrialization in Uganda, the raw materials imported are not taxed. Yet Uganda Baati is not happy at the current situation in Uganda's business environment. "Our business has been doing well but some of the government's policies are not favourable to us. Our competitors have been given tax exemption on goods we produce, for example galvanized steel coils," complains Mohan. "Industrial policies in the steel sector are not harmonized. If our competitors are importing raw materials at zero duty, it means we are not protected. Industries should have a level playing field," adds Bhatnager. 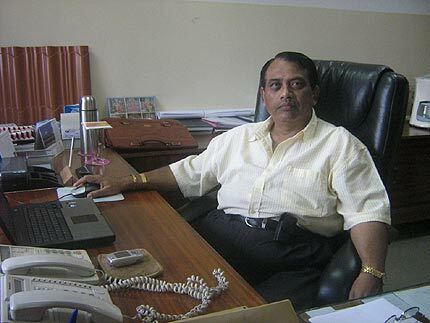 Top gun: Rakesh Bhatnagar, Executive Director, Uganda Baati. 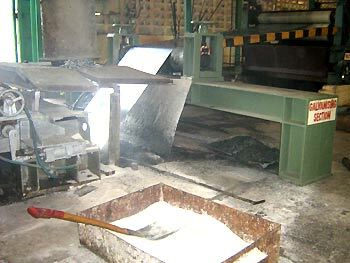 It is common knowledge that rampant power load shedding because of the current energy shortage in the country has also had a devastating effect on the manufacturing sector.� Uganda Baati had to procure their own power generation set to ensure the continuous production of iron sheets, since all their work and product chain depends on electric energy. This was naturally followed by increased costs of production, meaning their products became more expensive for customers. "If the Ugandan government's policy changes, we are looking at expanding. We have already applied to the Uganda Investment Authority for 30 acres of land for forward and backward integration so that we can make products which we currently import (like CR coils). We can also start a colour-coating line and save the money spent on imported coloured sheets," Mohan says. 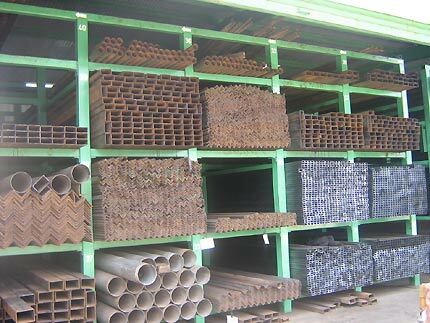 Bhatnagar adds that Uganda Baati want to start producing all the raw materials they use for making iron sheets and steel products, including the coloured sheets which are currently imported.